Google Calendar - I love it! For years now, I have tried oodles of different apps for my To Do List. From simple calendars to more complex apps, nothing worked for me. 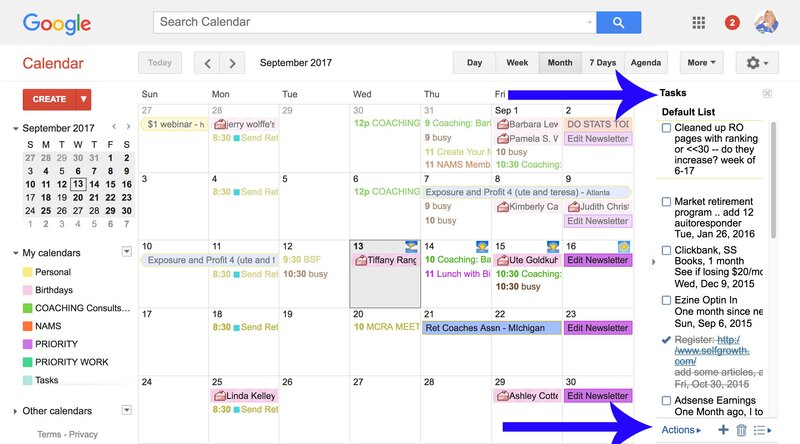 Recently, I revisited Google Calendars... and they are FREE for your use. 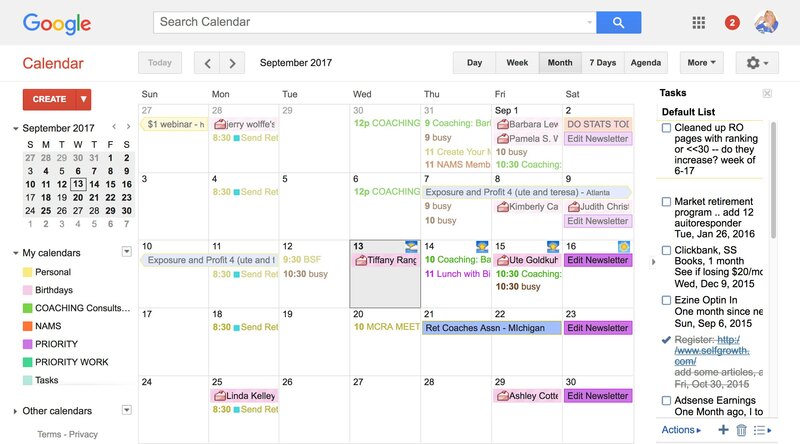 I have Google Calendars on my computers and phone. This is a screenshot from my calendar. See the tabs? You can view your calendar by day, week, month. 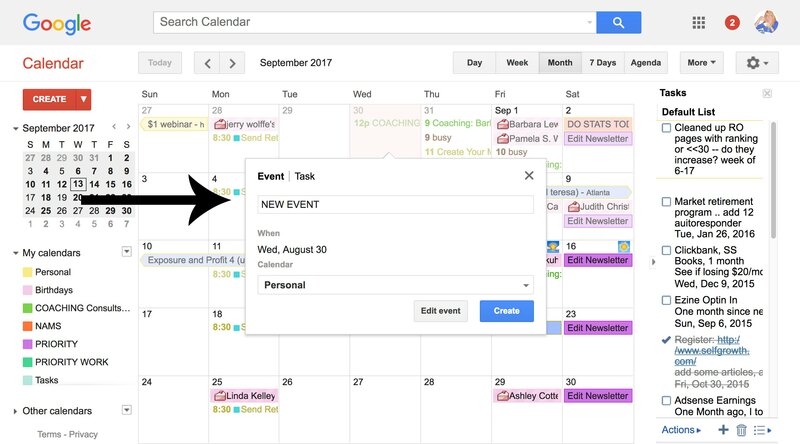 On Scheduling Tasks, I've been using Google Calendars recently and love it! I've tried SO MANY "to do" apps, never worked... this does. 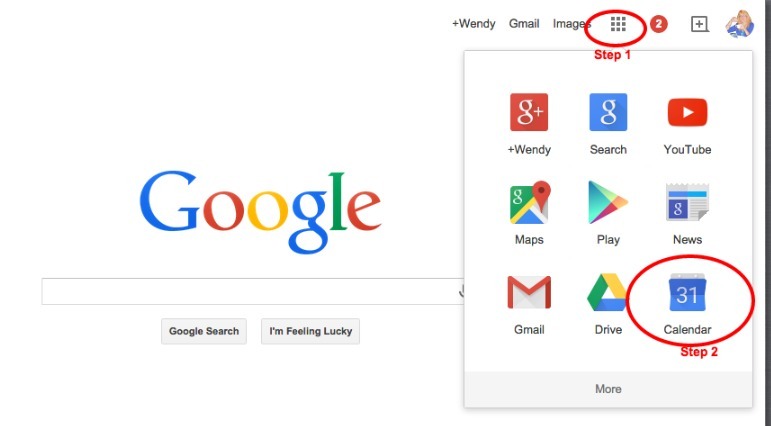 You can easily find it - Google, click on block with 9 squares top right to get any google products and there it is. Click on the day of the week, and enter it. Add your doctor appointments, luncheon meetings, whatever you intend to attend! I clicked on Aug 30th, below, and a new box opens. 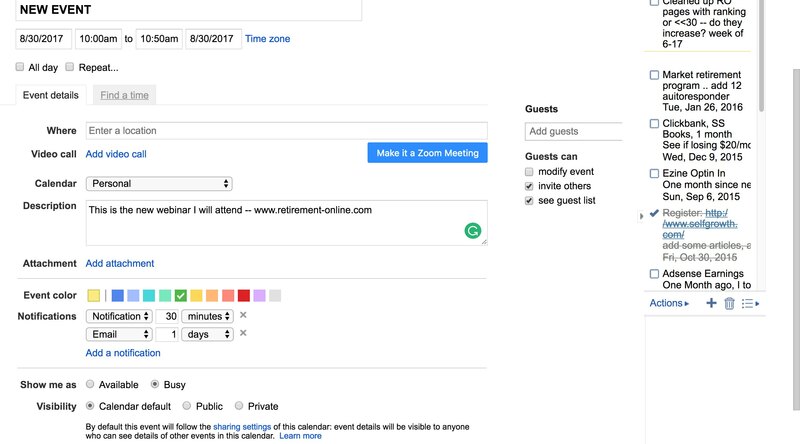 The calendar automatically does ALL DAY, but if you click on ALL DAY - you can edit the time frame for the event. I added a description, changed the color it will appear on the calendar, and added notifications too. I use it for my home business and personal life too. I schedule everything here: webinars, personal appointments, coaching, conferences, and lots more. Use edit to change the color, the time, description (I add the clickable link to webinars), and how/when you want to be reminded. LOVE the Reminders! Add the event, but take your time editing it afterwards -- check out all the functions of each event. If this is a recurring event, mark it as so, and it will appear week after week, or day after day... you don't have to enter it multiple times! This can be your day to day to do list too! Tasks are located to the right of the calendar. The tiny + at the bottom of the column is how you will add an item to your To Do List. I love to check off a box and the line goes through it, showing it was completed. I can delete or leave there. The tasks remain at the top of each day in one color - and when you complete a task, check off the box and the calendar item will appear as done! Day or Agenda Mode gives me a glance and action plan. Google Calendar just works for me, maybe will help you too?